No company is entitled to commence its operations unless file a declaration within 180 days of its incorporation stating that the subscribers to the Memorandum of the company has paid the value of shares so agreed by them, and files a verification of its registered office address with the Registrar of Companies (ROC) within 30 days of its incorporation. Non-compliance with this provision will result in the removal of the company’s name from the Registrar of Companies. Commencement of Business:- Obtaining Certificate of Commencement business again introduced by Ministry of Corporate Affair under newly introduced The Companies (Amendment) Ordinance 2018, hereby all companies registered in India after the commencement of the Companies (Amendment) Ordinance, 2018 and having a share capital is required to obtain commencement of business (COB) certificate before commencing any business or exercising any borrowing powers. This Ordinance was introduced in November 2nd 2018. This certificate establishes that the company’s business has been started. For whom this is Applicable? 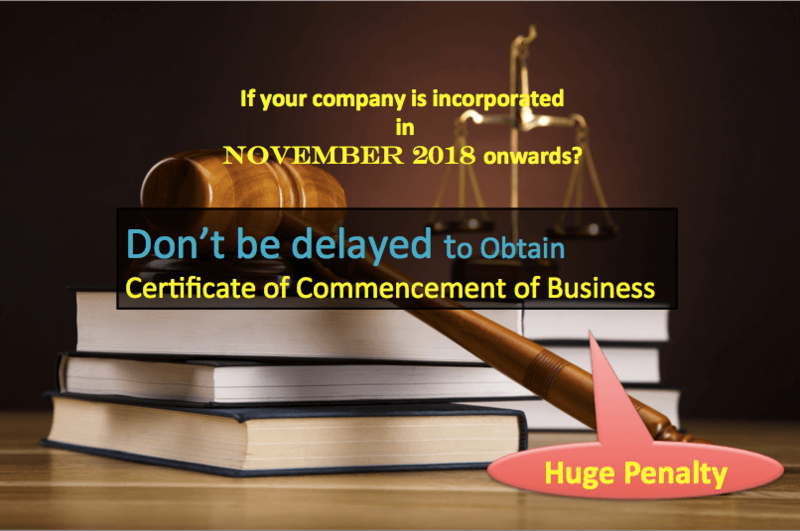 Companies incorporated in India on or after 2nd November 2018. COB must be obtained within 180 days of incorporation of the company. Suppose, If your company’s Date of Incorporation is 01-12-2018, COB must be obtained before 30-05-2018. To obtain COB, file e-form INC-20A with MCA, certified by practicing CA/CS/CMA. While filing the application for commencement, each of the Directors of the company must declare that every subscriber to the memorandum has paid the value of the shares agreed to be taken by him/her on the date of the making of such declaration. Penalty for non-Compliance or Delay ? Penalty levied on Company:- Any company that does not obtain commencement of business certificate within 180 days of incorporation will be liable for payment of a penalty of Rs.50,000. Penalty levied on Directors:- Each of the Directors who have defaulted would be liable for payment of a penalty of Rs.1000 per day of default upto a maximum of Rs.1 lakh. Further Consequences for Non-Compliance by ROC? Company Strike-Off:- Further, after 180 days of incorporation, if the Registrar has reasonable cause to believe that the company is not carrying on any business or operations, ROC may initiate action for the removal of the name of the company from the register of companies. For any Assistance in Compliance? Call us on +91-7678243418 or email at info@fintaxx.in | FinTaxx Corporate Professionals LLP.